At its height in the early 9th century, the Pala Empire was the dominant power in the northern Indian subcontinent, with its territory stretching across parts of modern-day eastern Pakistan, northern and northeastern India, Nepal and Bangladesh. The empire reached its peak under Emperors Dharmapala and Devapala. The Palas also exerted a strong cultural influence under Atisa in Tibet, as well as in Southeast Asia. 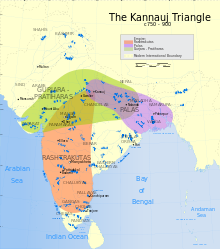 Pala control of North India was ultimately ephemeral, as they struggled with the Gurjara-Pratiharas and the Rashtrakutas for the control of Kannauj and were defeated. After a short lived decline, Emperor Mahipala I defended imperial bastions in Bengal and Bihar against South Indian Chola invasions. Emperor Ramapala was the last strong Pala ruler, who gained control of Kamarupa and Kalinga. The empire was considerably weakened by the 11th century, with many areas engulfed in rebellion. The resurgent Hindu Sena dynasty dethroned the Pala Empire in the 12th century, ending the reign of the last major Buddhist imperial power in the Indian subcontinent. The Pala period is considered one of the golden eras of Bengali history. The Palas brought stability and prosperity to Bengal after centuries of civil war between warring divisions. They advanced the achievements of previous Bengali civilisations and created outstanding works of art and architecture. They laid the basis for the Bengali language, including its first literary work, the Charyapada. The Pala legacy is still reflected in Tibetan Buddhism. Ramapala was the last strong Pala ruler. After his death, a rebellion broke out in Kamarupa during his son Kumarapala's reign. The rebellion was crushed by Vaidyadeva, but after Kumarapala's death, Vaidyadeva practically created a separate kingdom. According to Ramacharitam, Kumarapala's son Gopala III was murdered by his uncle Madanapala. During Madanapala's rule, the Varmans in east Bengal declared independence, and the Eastern Gangas renewed the conflict in Orissa. Madanapala captured Munger from the Gahadavalas, but was defeated by Vijayasena, who gained control of southern and eastern Bengal. A ruler named Govindapala ruled over the Gaya district around 1162 CE, but there is no concrete evidence about his relationship to the imperial Palas. The Pala dynasty was replaced by the Sena dynasty. 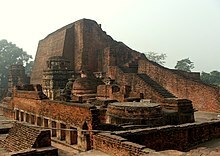 Nalanda is considered one of the first great universities in recorded history. It reached its height under the Palas. 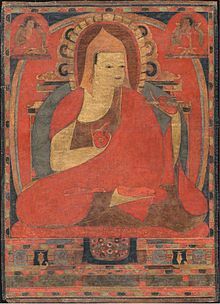 Atisha was a Buddhist teacher, who helped establish the Sarma lineages of Tibetan Buddhism. The Palas were patrons of Mahayana Buddhism. A few sources written much after Gopala's death mention him as a Buddhist, but it is not known if this is true. The subsequent Pala kings were definitely Buddhists. Taranatha states that Gopala was a staunch Buddhist, who had built the famous monastery at Odantapuri. [not in citation given] Dharmapala made the Buddhist philosopher Haribhadra his spiritual preceptor. He established the Vikramashila monastery and the Somapura Mahavihara. Taranatha also credits him with establishing 50 religious institutions and patronising the Buddhist author Hariibhadra. Devapala restored and enlarged the structures at Somapura Mahavihara, which also features several themes from the epics Ramayana and Mahabharata. Mahipala I also ordered construction and repairs of several sacred structures at Saranath, Nalanda and Bodh Gaya. The Mahipala geet ("songs of Mahipala"), a set of folk songs about him, are still popular in the rural areas of Bengal. ^ Michael C. Howard (2012). Transnationalism in Ancient and Medieval Societies: The Role of Cross-Border Trade and Travel. McFarland. p. 72. ISBN 978-0-7864-9033-2. ^ The Śaiva Age: The Rise and Dominance of Śaivism during the Early Medieval Period. In: Genesis and Development of Tantrism, edited by Shingo Einoo. Tokyo: Institute of Oriental Culture, University of Tokyo, 2009. Institute of Oriental Culture Special Series, 23, pp. 41-350. ^ Sailendra Nath Sen (1999). Ancient Indian History and Civilization. New Age International. pp. 280–. ISBN 978-81-224-1198-0. ^ a b R. C. Majumdar (1977). Ancient India. Motilal Banarsidass. pp. 268–. ISBN 978-81-208-0436-4. ^ a b c d e f g h i j k l m n o p q r s t u v Sailendra Nath Sen (1999). Ancient Indian History and Civilization. New Age International. pp. 277–287. ISBN 978-81-224-1198-0. ^ a b c d e f g h i j k l Sengupta 2011, pp. 39–49. ^ Bagchi 1993, p. 37. ^ Vasily Vasilyev (December 1875). Translated by E. Lyall. "Taranatea's Account of the Magadha Kings". The Indian Antiquary. IV: 365–66. ^ Ramaranjan Mukherji; Sachindra Kumar Maity (1967). Corpus of Bengal Inscriptions Bearing on History and Civilization of Bengal. Calcutta: Firma K.L. Mukhopadhyay. p. 11. ^ J. C. Ghosh (1939). "Caste and Chronology of the Pala Kings of Bengal". The Indian Historical Quarterly. IX (2): 487–90. ^ M. N. Srinivas (1995). Social Change in Modern India. Orient Blackswan. p. 9. ISBN 978-81-250-0422-6. ^ Metcalf, Thomas R. (1971). Modern India: An Interpretive Anthology. Macmillan. p. 115. ^ André Wink (1990). Al-Hind, the Making of the Indo-Islamic World. BRILL. p. 265. ISBN 90-04-09249-8. ^ Ishwari Prasad (1940). History of Mediaeval India. p. 20 fn. ^ a b Biplab Dasgupta (2005). European Trade and Colonial Conquest. Anthem Press. pp. 341–. ISBN 978-1-84331-029-7. ^ John Andrew Allan; Sir T. Wolseley Haig (1934). The Cambridge Shorter History of India. Macmillan Company. p. 143. ^ Bindeshwari Prasad Sinha (1977). Dynastic History of Magadha. Abhinav Publications. p. 179. ISBN 978-81-7017-059-4. ^ a b Bindeshwari Prasad Sinha (1977). Dynastic History of Magadha. Abhinav Publications. p. 185. ISBN 978-81-7017-059-4. ^ Sengupta 2011, p. 45. ^ John Keay (2000). India: A History. Grove Press. p. 220. ISBN 978-0-8021-3797-5. ^ John Andrew Allan; Sir T. Wolseley Haig (1934). The Cambridge Shorter History of India. Macmillan Company. p. 10. ^ Bagchi 1993, p. 4. ^ Bindeshwari Prasad Sinha (1977). Dynastic History of Magadha. Abhinav Publications. pp. 177–. ISBN 978-81-7017-059-4. ^ Paul 1939, p. 38. ^ Bagchi 1993, p. 39–40. ^ Paul 1939, p. 122–124. ^ Paul 1939, p. 111–122. ^ Huntington 1984, p. 39. ^ Taranatha (1869). Târanâtha's Geschichte des Buddhismus in Indien [History of Buddhism in India] (in German). Translated by Anton Schiefner. St. Petersburg: Imperial Academy of Sciences. p. 206. Zur Zeit des Königs Gopâla oder Devapâla wurde auch das Otautapuri-Vihâra errichtet. ^ P. N. Chopra; B. N. Puri; M. N. Das; A. C. Pradhan, eds. (2003). A Comprehensive History of Ancient India (3 Vol. Set). Sterling. pp. 200–202. ISBN 978-81-207-2503-4. ^ Bagchi 1993, p. 19. ^ Bagchi 1993, p. 100. ^ Krishna Chaitanya (1987). Arts of India. Abhinav Publications. p. 38. ISBN 978-81-7017-209-3. ^ Chowdhury, AM (2012). "Pala Dynasty". In Islam, Sirajul; Jamal, Ahmed A. Banglapedia: National Encyclopedia of Bangladesh (Second ed.). Asiatic Society of Bangladesh. ^ Rustam Jehangir Mehta (1981). Masterpieces of Indian bronzes and metal sculpture. Taraporevala. p. 21. ^ Stella Kramrisch (1994). Exploring India's Sacred Art Selected Writings of Stella Kramrisch. Motilal Banarsidass Publishe. p. 208. ISBN 978-81-208-1208-6. ^ a b Dilip Kumar Ganguly (1994). Ancient India, History and Archaeology. Abhinav. pp. 33–41. ISBN 978-81-7017-304-5. ^ a b Susan L. Huntington (1984). The "Påala-Sena" Schools of Sculpture. Brill Archive. pp. 32–39. ISBN 90-04-06856-2. ^ R. C. Majumdar (1971). History of Ancient Bengal. G. Bharadwaj. p. 161–162. ^ Abdul Momin Chowdhury (1967). Dynastic history of Bengal, c. 750-1200 CE. Asiatic Society of Pakistan. pp. 272–273. ^ Bindeshwari Prasad Sinha (1977). Dynastic History of Magadha, Cir. 450–1200 A.D. Abhinav Publications. pp. 253–. ISBN 978-81-7017-059-4. ^ Dineshchandra Sircar (1975–76). "Indological Notes - R.C. Majumdar's Chronology of the Pala Kings". Journal of Indian History. IX: 209–10. ^ Paul 1939, p. 139–143. ^ Paul 1939, p. 143–144. ^ Bagchi 1993, pp. 2–3.